The old fort at Bidar, Karnataka. On the right is the Solah Khamba Masjid. 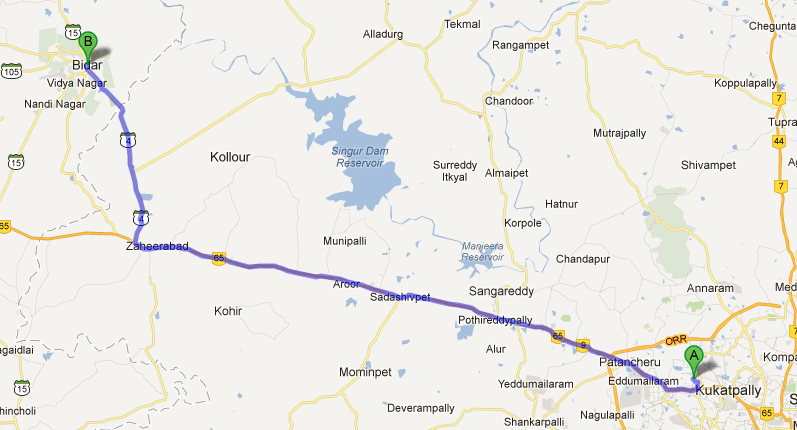 The route we took from Hyderabad to Bidar (courtesy – Google Maps). Last Saturday, my friend Kiran and me headed out to the city of Bidar, situated about 120 kms west of Hyderabad, in the nearby state of Karnataka. 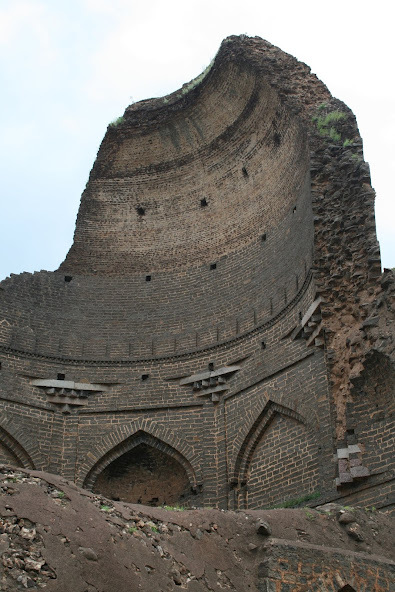 Bidar held an important and central position in the Deccan plateau. Many kings wanted control of the city. It passed hands between the Kakatiya kingdom, the Bahamani Kings, the Mughals and the British among many others. Now, the city hardly looks like a power centre, an indication of the transient nature of empires. The first spot we went to was a very beautiful Gurudwara where Guru Nanak visited more than half a millennium ago. The founder of Sikhism in Bidar? Yes, the story goes that, in April 1512, Guru Nanak on one of his travels around the world reached Bidar. The people requested him to solve their problem of salty water, and he touched a spot on a hillock leading to the creation of a sweet water source. 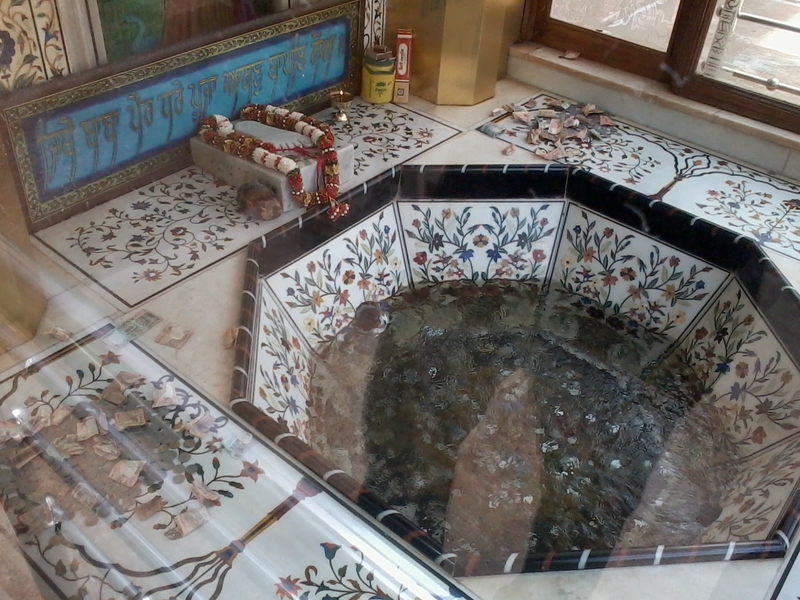 Amrit Kund (literal translation – nectar source) and the Guru Shri Nanak Jhira Saheb (the Gurudwara complex) nearby honors him and this event. 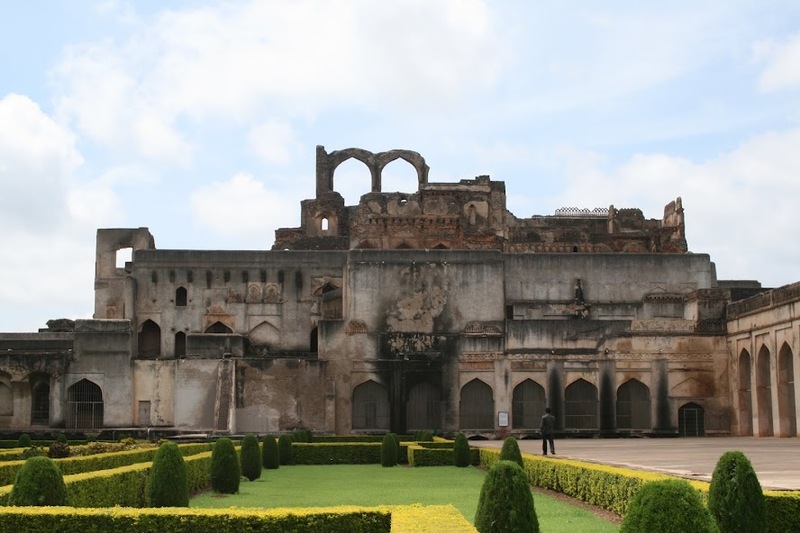 The Bidar fort is considered to be among the strongest and largest forts in India. Inside, we found that access to most of the monuments is restricted. Although the structures are very imposing, there is hardly any sculpting work on them. Most of the buildings seem too plain (not sure why, probably because they have got damaged). The land around is beautiful though – rolling green hills dotted with trees and small settlements. Locals told us that the fort premises are now much improved because of the new DGP, who has started cleaning up things to promote tourism. We found fighter jets flying above every 20 minutes or so – the Indian Air Force has a training academy in this city. After checking out the British Choubaara (watch tower) and a dargah, the last stop was the village of Ashtur, where we came across the tombs of the Bahamani kings. The spherical top of Humayan’s tomb (a Bahamini King and not the great Mughal emperor) is half damaged and looks odd. The roads were pretty good and a surprising thing – just as we crossed the Karnataka state border, the road quality suddenly improved! The trip was very pleasant what with the partially cloudy skies keeping us company throughout. And how can I forget the Bollywood connection? The song Ishq Sufiaana from the movie The Dirty Picture was shot in the palace ruins inside Bidar fort (and no, that was not my primary reason for visiting the place!). Tomb of the Bahamani King Humayun, Ashtur. Nice to hear about Amrit kund. You’ve got some good pictures here. ever may be the persons height . Yeah, we completely missed out on the temple! We later came to know about it. I remember a visit to Bidar including the fort and the gurudwara a couple of years ago, I like it very much. Your pictures are beautiful. I visited Bidar over 25 years ago, I rememeber it well, the ruins of a madressa were impressive, the beautifully carved tiles. Thanks for briging back all those fond memories of a wonderful day in the Deccan! Thanks, Bindu masi. We hardly found any sculpture work, probably because it is either damaged or because it is now off-limits for public.